Local society around Tenebrous hill know a legend associated with the hill. It is said that there were two leaders who are believed to be descendants of the gods in the State Sintang. One of them is known as Sebeji or Bujang Beji who were destructive, covetous, and greedy. His greed, especially in the knowledge of magic. He did not want other people to be more powerful than himself. The other was Temenggung Marubai with the opposite nature of Sebeji. He loved to help, good-hearted, and humble. The two leaders main livelihood was fishing, farming and gardening as well. 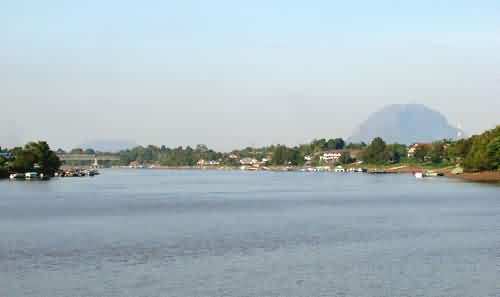 Bujang Beji and his followers control the river in Simpang Kapuas, whereas in Temenggung Marubai in Simpang Melawi. Fish in the river Simpang Melawi varied and more numerous than in Simpang Kapuas. Temenggung Marubai’s fishing in the river Simpang Melawi using giant bubu (fish trap) from the bamboo stems and cover part of the river with stones. That way, the fish are more easily trapped into his bubu. The fish were then selected. Only the big fishes are taken, while the little fishes are released into the river until it becomes a big enough to be captured again. This way, the fishes in the river Simpang Melawi will never run out and continue to breed. Knowing this, Bujang Beji envied. He then caught fish in the Simpang Kapuas by using tuba (ie poisoning the fish with the tuba, which is a kind of fish poison from the intoxicating roots of forest vegetation). That way, he was getting more. Initially, the fish gained by Bujang Beji is more than Temenggung Marubai’s. However, gradually the fish in the river was up. While in Simpang Melawi, the fish seemed inexhaustible. It made Beji Bujang more envy and jealous to Temenggung Marubai. Then he had bad intentions. He stopped the flow of the Simpang Melawi river by closing the upper reaches. So, he picked the top of Batu hill in Nanga Silat. In the midde of the way, he fell and the top of the hill also fell on a shoreline (beach along the bay or river coastal) called Jetak. His efforts to lift the top of the hill again was a failure. So,the top of the hill was stuck in its place. The top of the hill later became what we know as Tenebrous Hill today.